Key specifications: Operating system: Windows 10 Home Processor: 7th Generation Intel Core i7-7500U Processor Display: 15.6-inch diagonal HD SVA WLED-backlit touchscreen (1366x768) Memory: 12 GB DDR4 SDRAM (2 DIMM) Hard drive: 1TB 5400RPM Serial ATA hard drive Graphics: Intel HD Graphics 620 Audio: B&O PLAY with dual speakers Battery life: Up to 9 hours and 15 minutes (mixed usage) Wireless: 2x2 802.11ac WLAN(19a) and Bluetooth Webcam: Front-facing HP Wide Vision HD Webcam with integrated dual array digital microphones Optical drive: DVD-Writer Product weight: 4.67 lbProduct features: Windows 10 Home: Do great things confidently with the familiar feel of Windows - only better. 7th generation Intel Core i7 processor: Powerful performance easily keeps up with all your multitasking demands and enables new ways to interact with your PC. HP Fast Charge: Go from 0 to 90% charge in approximately 90 minutes. Liberating battery life: Take on the day without worrying about recharging. Hard drive storage: Grow your digital collections and still have room left over. Intel HD Graphics: Renders all the visuals on screen with smooth, vivid quality. Re-writable DVD drive: Watch and write DVDs using the integrated optical drive. A truly powerful audio experience: HP Dual Speakers, HP Audio Boost, and tuning by B&O PLAY deliver a rich, authentic audio experience. HP Wide Vision HD Camera: 88-degree, wide-angle field of view for video chats with the whole family. HD touchscreen: Pinch, zoom, and swipe to intuitively control your PC right from the screen. DDR4 RAM: With its higher bandwidth, everything from multi-tasking to playing games gets a performance boost. Sleek design: Easily take this thin and light PC from room to room or on the road. Rock-solid connections: With the latest 802.11 a/c (2x2) WLAN adapter and Bluetooth 4.2, all your connections are rock solid and up to 6 times faster than 802.11n 1x1. Dropbox cloud storage: If you dont have it today, sign up to get 25 GB of Dropbox space free for 12 months with your HP device. Experience the advanced digital assistant, Cortana. Utilize dual microphones and HP premium speakers to help become more productive with Cortana, and HP collaboration and conferencing solutions. Leave passwords behind. Say hello to a new way to securely login without passwords using Windows Hello. McAfee LiveSafe: Protect your operating system with a free 30-day McAfee LiveSafe trial. 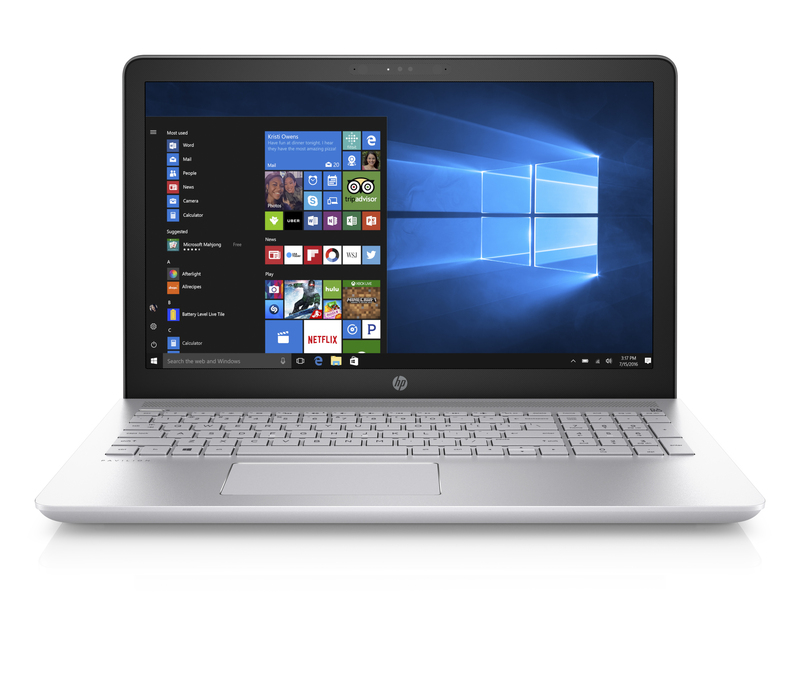 I received a shipment of an HP Pavilion Notebook with the following features: 15.6 inch HD Touch Display; Windows 10 Operating System; Intel Core i7 Dual Core; 1 TB Hard Drive; 12 Gigabyte System Memory (RAM); DVD Writer; USB Type C. It also has an HDMI port, two standard USB ports, a microphone / headphone jack, a lock port and an SD card slot. The color of my Pavilion Notebook is silver. The entire Pavilion line comes with a metal outer casing (including the keyboard area). The setup is very user friendly without any immediate fear of viral attack because out-of-the-box McAfee anti-virus is on-board. The setup steps: put the power cord together; plug it into the PC and an outlet; push the power button on; answer onscreen queries and instructions posed throughout. The wireless setup is done during this process. I had the option at one point to hear Cortana ask questions, etc. or continue to do it all onscreen. When the setup was complete, I did three more things before I really felt I had made my new PC my own. The first was installing my chosen anti-virus - mine allows for five devices so I was covered and their website instructions, accessed from my task-bar, guided me through. Then the next task was installing the wireless printer drivers and software. The printer manufacturer has a very efficient, knowledgeable and friendly customer service team who guided me through setting up wireless printing. The final task was fun - adding my favorite applications. Some of my apps had cloud storage in One-Drive (an option offered during setup) so I could easily populate them with data from my old laptop. The touchscreen and on-screen keyboard are awesome and work beautifully. I always use the actual keyboard so far for what I do. I know the touchscreen would be wonderful for note taking and drawing among other things - I use it most often to reach over the laptop to touch the screen so I can stop a movie or a song when I get busy away from the PC. The battery power is good for all day (maximum is just over 9 hours with 90% recharge in 90 minutes). I have not had to try it out since to-date mine is always plugged in at home. The shipping carton can be re-used for storage or shipping since it is sturdy, thick cardboard complete with an encasing thick cellular packing foam that braces the PC securely within the carton so it doesn't move as well as providing space at one end for the power cord. The carton also provides the product information which includes the phrase \"The Perfect Balance of Performance and Style\". I agree - I have felt comfortable with it from the first day and love the look, speed, power, display and features. Feel-good style: Every detail was crafted for comfort and style�from the elevated keyboard to the bold design. Power through your day: With up to 9 hours and 15 minutes of mixed usage battery life and a 90% charge in 90 minutes, stay powered all day with charge to spare. A truly powerful audio experience: Dual HP Speakers, HP Audio Boost, and tuning by B&O PLAY deliver a rich, authentic audio experience. Tbook.com crawls the web to find the best prices and availability on Hot Products and related Computer Products products like HP Silver Iridium 15.6" Laptop, Touchscreen, Intel Core i7-7500u, Intel HD Graphic 620 Graphic Card, 12GB.... For this page, related items include products we find that match the following keywords: "COMPUTER computer|HP Computer COMPUTER|Dell Computer DELL|Lenovo Computer LENOVO" at our vendor partner Walmart. HP Silver Iridium 15.6" Laptop, Touchscreen, Intel Core i7-7500u, Intel HD Graphic 620 Graphic Card, 12GB... is one of 16 Hot Products and related products listed in the Computer Products section of Tbook.com If you have any questions on this product, please give us a call at 734-971-1210 during the hours of 9am - 5pm EST for assistance. Thank you for shopping at Tbook.com, the Internet Department Store!